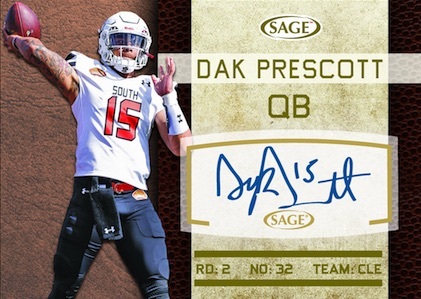 While many of their other NFL prospect releases skew more to the low- or mid-end format, 2016 Sage Autographed Football pushes that into overdrive with two autographs per pack and 24 total in every box. 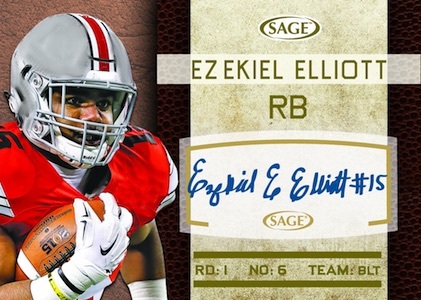 The all-autograph set offers collectors another early look at the 2016 collecting season with many of the top options heading into the NFL Draft. This includes key offensive players like Jared Goff, Ezekiel Elliott and Paxton Lynch, along with many others. A full early checklist can be seen using the tab above. 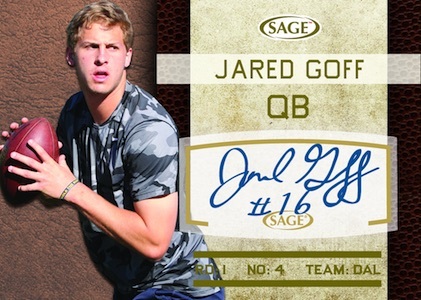 Although the overall choices are limited, 2016 Sage Autographed Football features signed cards in several formats with a thicker stock and raised foil. The main Autograph design has a horizontal orientation and parallels include limited options that are numbered to 25, 20, 5 and 1/1. While 23 of the autographs will fall into the main category, one additional signed card in every box will either be a Cut Signature or PRO-lific Pairs Dual Autograph. The Dual Autographs may take on added appeal from collectors as they combine former teammates or players with a shared connection. Check back as more information for 2016 Sage Autographed Football is provided. These are mock-up images and not final cards. Designs and contents subject to change.